A non-denominational ministry formed by the General Commission on UM Men is sending 1,000 copies of Strength for Service to God and Country to Sailors and Marines deploying from San Diego in October. The historic books, provided by St. Louis-based World Wide Technology, were first published in 1942 for World War II troops deploying for Asia and Europe. Marines and Sailors “man the rails” of the amphibious transport dock ship USS Somerset The marines are with the 11th Marine Expeditionary Unit and the sailors are with Amphibious Squadron Five. (U.S. Navy photo by MC1 Vladimir Ramos/Released). Seventy-four years later the devotions written by 365 authors in 1942 and 50 contemporary authors will be read by marines and sailors deploying to defend their nation. The books were requested by Chaplain Todd Delaney, command chaplain of the 1st Battalion of the 11th Marine Expeditionary Group, based at Camp Pendleton. Four hundred books are being delivered to the USS Somerset; 400 to the USS Makin Island, and 200 to the USS Comstock. 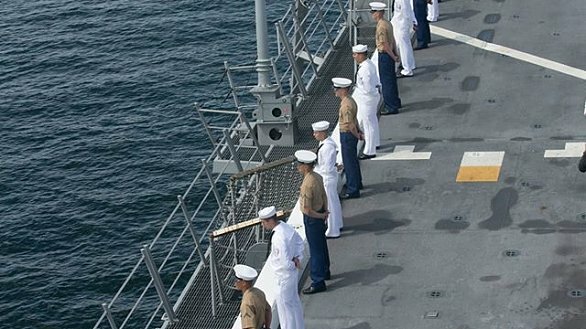 A total of 4,000 Marines and Sailors are ready to deploy accompanied by eight chaplains. DeLaney asked for the books to be sent to the chaplains of each ship.